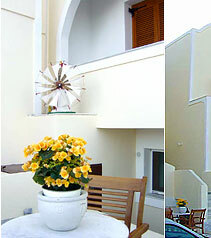 Anemomilos Suites is a traditionally designed building situated just a few meters from the central square of Fira town, (Santorini island capital), close by the Bellonio Cultural Centre. 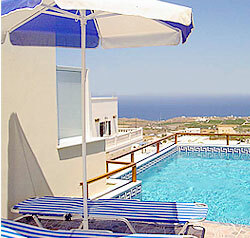 It offers a marvellous view of the Aegean sea. The hotel has a swimming pool with Jacuzzi. 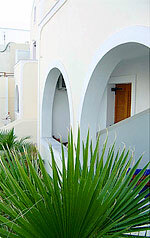 Anemomilos Suites can be found in Fira, capital of the island. Fira is home to museums, the main taxi rank, bus terminal, local banks, supermarkets, Santorini island nightlife, cafes, restaurants & bars. 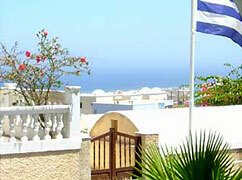 A couple of minutes walk away is the famous Santorini Caldera & the Volcano. The Hotel Reception is available for any information about our island. We offer the additional option of renting a car or motorbike during your stay. We are always at your service. Our Mini Bus used for transportation of hotel guests. 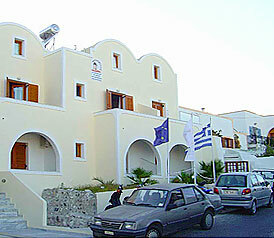 Transfers from & to Anemomilos Suites from Athinios port or Santorini International airport is complimentary. 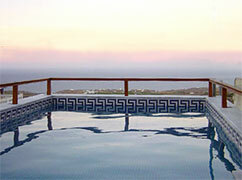 Four maisonettes, suitable for newly weds and for families with one or two children and four traditional rooms. All the rooms have their own bathroom , veranda, fridge, air conditioning, direct dial phone, Satellite TV, safety box and hairdryer. Four of these offer a bath tub with jacuzzi.